Seasoned pros may take years to develop the perfect vegan doughnuts. Today I learned the hard way why that is: it's not easy. I'm hosting a Halloween/Fall brunch get-together tomorrow, and figured pure veg Apple Cider Doughnuts would be the perfect treat to serve. I decided to give my doughnuts a test-run today, and while I consider myself a pro when it comes to baking cakes and mini cakes for my Sweeties brand, I'm entirely not a pro at baking doughnuts — this was my first time, even! The baked pure veg doughnuts came out alright. They were incredibly tasty but I can't say I was crazy about the texture. What I did? I wound up cheating, and fried the little guys for a few seconds in some hot oil after they came out of the oven. Then I rolled them in cinnamon and sugar. I'll share the recipe next week for those who might want to give it a whirl. Also coming up next week: A mini behind-the-scenes look at the last Recipe Trail Club meeting. I was the RTC host this time around, and had a chance to get some great feedback on a new seasonal Sweeties cupcake flavor. I'll share some more about that with you, and the recipe for Terry Hope Romero's awesome Caesar Salad with homemade croutons and dressing. I'll admit it was sort of funny to see her in my kitchen preparing the salad for us right under the cabinet book shelf that holds copies of her cookbooks Veganomicon, Vegan Cupcakes Take Over the World and Viva Vegan! And last but definitely not least, a bonus recipe will be coming up this week for Fettuccine Alfredo, made with Tofu Ricotta Cream Sauce — totally delicious, and it couldn't be easier to whip up for a great weeknight dinner. Have a great weekend, and I'll catch up with you next week. I'm getting ready to make a crack at these too! Just had apple cider doughnuts at the Union Square Farmer's Market last week for the very first time (I know, right?!) and I loved how they were such simple comfort food. Using apple butter is genius. 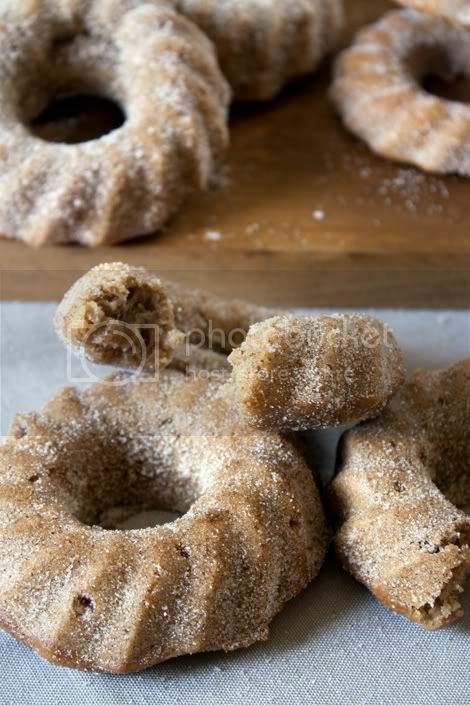 I love how you used the mini bundt pan mold to get them to look absolutely perfect. I'm not surprised the fried versions up the ante a little bit. Since when has baked ever tasted better than fried haha. Excited to see how the finals turn out! The apple butter worked really well, and I chose the pan because it was perfect for doughnuts but it's also fluted so they look prettier than regular plain round doughnut molds. I'd love to hear how yours turn out. This recipe baked soft doughnuts (that's why I fried them after baking), and I'd like to figure out how to get a better texture for these without frying. That's just too weird!! Great minds must really think alike, or else this Recipe Trial Club is engendering sympathetic telepathy. I TOO have been experimenting like mad with apple cider doughnuts, of all things! Tis the season, I suppose. I love your mold, Alyssa - they make the doughnuts really lovely. And like yourself, I've tried the baked version of the doughnuts several ways so far, and am also not satisfied with their texture. Am considering trying a fried version just to see how it compares...anyway - look forward to seeing both yours & Mattie's final versions.